Helpful little site that I’m going to use with customers who get amped up about "all their memory" being used. "Now is the best time of our lives." Looks like some pretty nice stuff for ops. Turned 38 this year (holy crap!) and figured that I actually needed to start living a bit instead of just working all the time. For some reason I decided that “living” meant climbing / hiking (relatively) tall mountains so in August I organized a bunch of guys from work to climb South Sister here in Oregon, which was awesome and then just this last weekend some of the same group (and a couple of other guys) climbed Mount St. Helens. One *awesome* twist: we did it at night, mostly because I was out of husband points and couldn’t afford another full weekend away. 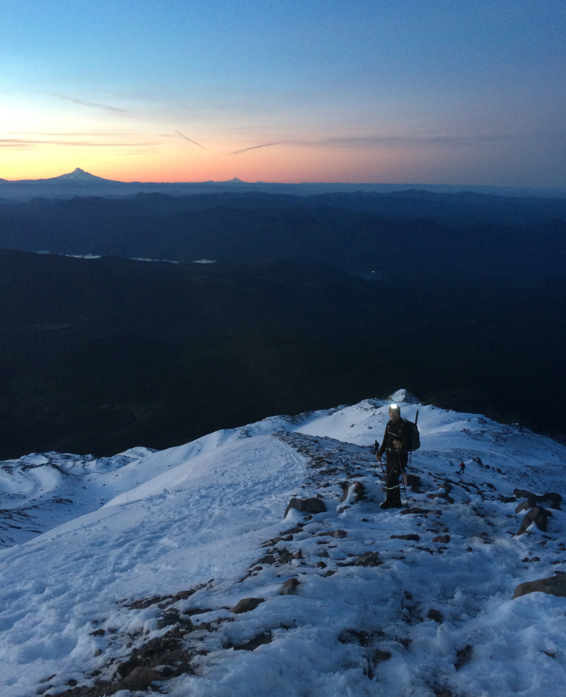 We (Alex, Jacob, Joe, Chris, Greg and I) ended up leaving downtown Portland at around 11:40pm, got up to the trailhead (Climbers’ Bivouac) at around 1:00am, attempted to sleep for 30 minutes and then hit the trail at around 2am. It was pitch black (new moon) so we all had headlamps, which made the first mile or so relatively spooky, like something out of a bad movie where all you can see are trees and then darkness. And it was quiet, in fact we didn’t see any other hikers until the next morning when we were coming down. One of the guys that came with us (hey Greg!) works at Jive and turned out to be a volunteer at the Mt St. Helens Institute, which runs the permitting system and having him on the trip was super helpful. For the first couple miles it’s relatively easy to stay on the trail, since there’s actually a trail but then you hit the rock field and at that point, the trail disappears and you have to look for these 4-6 foot tall posts, which in the daylight I’m sure are easy to spot but at 3am under a new moon are not so easy to spot. Greg (luckily?) brought a really nice spotlight (from his bike IIRC) that was at least 2x brighter than any of the headlamps that we had which he used every couple hundred yards or so to illuminate the next post that we had to aim for. This continued on for awhile and then we started hitting the snow and ice. 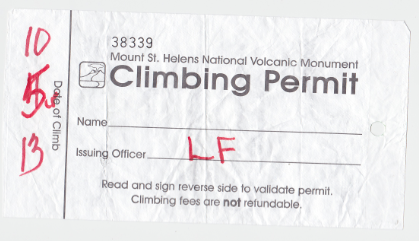 Turns out we were super lucky: after the South Sister trip I badgered one of the guys (Alex) to get us some permits for St Helens since he was planning on going. The first weekend that opened up, which we thought would be perfect, was 9/27-28, which, fortunately for us, turned out to be really hard to get permits for (http://purmit.com/) and so we ended up with permits for 10/5. Lucky for us, the weekend of 9/27 turned out to be (literally) record rains for Oregon and Washington and would have made for a horrible climb. The Friday / Saturday that we ended up going was crystal clear and relatively warm but because of the rains the weekend before, meant snow was on the mountain. So the next couple miles, in fact all the way to the top, were full of snow and some ice. Only one guy had the foresight to bring crampons, which, in retrospect, we all should have had. There were definitely some parts of the climb that were dicey, where you couldn’t dig in your toe to make a step and felt like you might slip but the majority of the climb felt mostly safe. After a bunch of breaks, lots of silent one foot after another in the darkness hiking, we made it to the top around 6:30am, a bit earlier than we had anticipated since sunrise was supposed to happen at 7:14am. 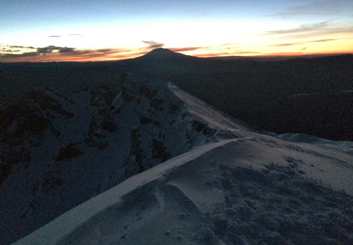 I had actually done some research prior thinking that at altitude, that sunrise might happen earlier (which would have been nice) but it turns out (IIRC) that sunrise is affected about 1 minute per 1.5km of elevation, so at 8,300 feet, there wasn’t much to gain. Either way, the summit was amazing and after hiking all that time, a little bit cold. The group of us that made it hung out for a bit, didn’t get too close to the edge (lots of warnings about the cornices at the top of the summit), took some pictures and then headed on down. Four hours later and after passing a bunch of hikers who were just starting their hike, each of whom asked “are you guys coming down already?”, we arrived back at the car, ready to find to some real food. Or maybe that was just me who couldn’t wait to eat some real food. It was super fun, I can’t wait for the next climb, probably Mt. Adams.